This week our art is just a simple photograph of a normal, Sunday afternoon in small town America. 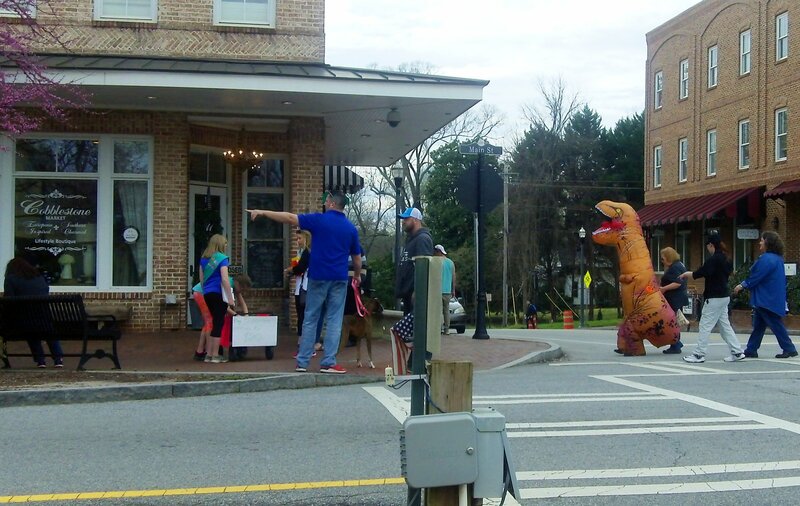 Taken last Sunday in Senoia, Georgia, this picture just struck me as a nice, Norman Rockwellesque, scene that shows the joys of smalltown life…and dinosaurs. I didn’t need to paint this or run it through any filters. It was fine just the way it is. Click to enlarge. Monday on The AIR, 7 AM sees a mini-marathon of our New Wave Showcase, Sydney’s Big Electric Cat, which comes at you for eight hours. Then at 3 PM you can settle in for eight more hours of great New Wave music with Sydney’s Big Electric Cat. At 11 PM you can spend you overnights with eight hours of the best Progressive Rock of the last half-century on Prognosis.